If someone wishes to grow a grape vine, it’s very easy to have this enjoyable, productive fruit growing on one’s trellis, arbor or pergola. Both for fertilization and to have vines which produce in different months, it’s a good idea to have two varieties. 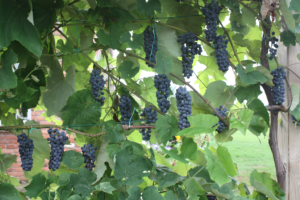 For example, , Fredonia (pictured here) an earlier table grape, ripens in August whereas Concord, a favourite juice variety ripens later. In fact, Concords are tastier after a frost. To root several cuttings, March or early April is an effective time of the year. This method involves more work and takes longer. 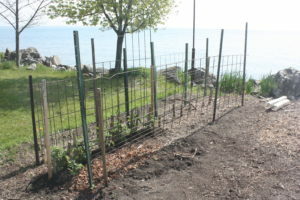 To simply make a couple rooted vines, the summer is an excellent and easy time. It also produces a much stronger root system. Five simple steps are depicted in the photo. 1. Find a grape vine which is putting out long new growth. 2. Make an trench 30 cm long about and 6 cm deep in the soil; water it well. 3. Lay the vine in the trench with the tip and a set of leaves extending beyond the end of the trench as shown. 4. Remove the leaves from the vine in the trench. 5. 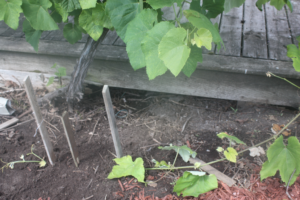 Place two sticks over the vine to hold it down and cover the vine with soil. The middle stick in the photo has been put there to show how the end has been cut to hold the vine. The vine in the explanation photo is attached to the fruited vine in the other photo grown as a privacy wall beside our townhouse deck. After a couple of months, a rooted vine can be removed from the soil and severed from the main vine to transplant in your desired location. Canadians are notorious for talking about the weather. The delay in warm weather this spring has made gardeners wonder when the ground will be warm enough to begin planting. There are several things an eager, anxious gardener can do to speed up the process. The “Greenhouse Effect” can be easily be replicated by some simple things. A very easy, effective and inexpensive way it to use a 2 litre plastic juice container. 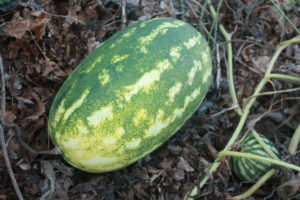 Cut out the bottom and place it on the soil for two days to allow the sun to warm the soil before planting. Even before the last frost, you can use this approach. If it gets too hot, remove the screw-on cap which also allows for watering. In the event frost is predicted, cover the container with leaves (preferably shredded) over night or for the duration of freezing weather. 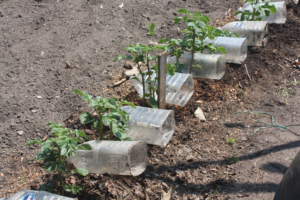 Larger areas of the garden can be warmed by covering the soil with a clear plastic drop sheet held down with landscape anchor pins both inexpensively obtained at a dollar store. Although black plastic attracts heat from the sun, the clear plastic allows the rays of the sun to penetrate and warm the soil “to a greater degree”. A third approach is to use an electric heating pad by placing it on a drop sheet (to keep it dry) and cover it with a tarp. Folding the tarp increases its insulation value. The two photos show a plant inside a plastic container and a row of containers which has been removed on a warm day. 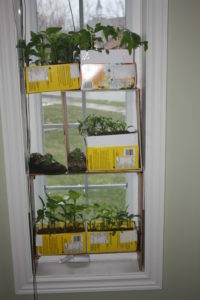 Growing annuals indoors may require additional window space. Rather than simply use the window sill, the growing area can be greatly expanded by adding extra layers of shelves. For those who have an easterly or southerly window, scrap 1/4 inch plywood the width of the window sill works wonderfully. The photo shows how the sunlit area of a window shelving can be tripled. Make the insert slightly narrower than the opening. Insert pieces of foam board or cardboard along the insert’s outer edges to keep it firmly in place and prevent damage. 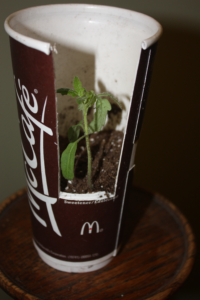 If the growing plants such as tomatoes begin to get lanky, the second photo shows how an insert in the container accommodates the growing seedlings. Not only does this addition keep the plants erect, adding soil encourages additional root growth along the stem producing a strong, healthy plant for transplanting. The seed was planted in the lower 1 1/2″ of soil; the ruler shows the plants now have 5″ of roots. 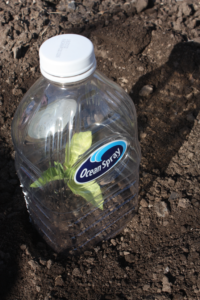 The seedlings can be watered weekly with a very dilute 1/4 Tbsp plant fertilizer: 1 gallon water. 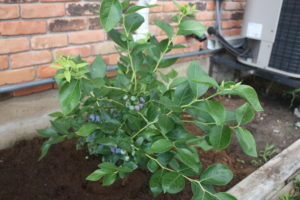 Also, be saving your crushed egg shells to put in the hole at transplanting , adds needed calcium to the soil which will significantly prevent blossom end rot. For flower growers, zinnia seed will germinate in 2 days with bottom heat of 75 F however they tend to get spindly. 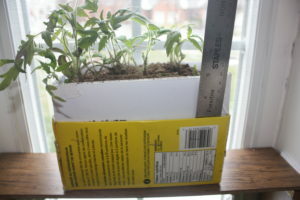 Using the expanded-sides-modification to the seedling box, will result in sturdy plants for transplanting later. 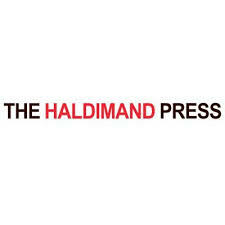 Thank you, GrandErie Home Hardware! In the past, having baby shoes bronze plated was a common and popular way of preserving precious memories. For some reason, that method is no longer practiced. 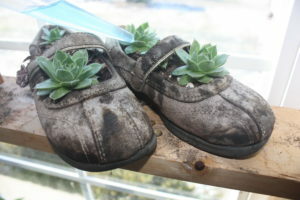 Keeping the memory alive and growing can be easily accomplished by using baby or children’s shoes as a potting source. In addition to saving family member’s shoes, using shoes readily available from a thrift shop is a great way to grow lovely houseplants or produce a product for resale. The photo shows shoes obtained at a thrift store. Because of their well worn condition, they could not be offered for resale. So, the author rescued them from going to the landfill site! Succulents are excellent plants which are very adaptable to such a small container. Shown here are Hens and Chickens. Other plants which will grow well in such a small space and minimum soil is the Mexican Hat Plant (Million Dollar Plant) or cacti. Also depicted in the photo is a convenient way of watering such a tiny container. This can be easily and efficiently done by using a roasting baster to allow the water to be absorbed slowly drop by drop. Although growing one’s annuals and vegetables indoors can be done easily and successfully, one limitation is the need to use sterile soil. Soil which is not sterile can result in importing unwanted insects into your home, disease and weeds. Sterilizing your soil is an easy and excellent way to avoid these problems. Two convenient ways to sterilize amounts of soil sufficient for starting seedlings is the use of the micro wave or an electrically heated device common in most kitchens. 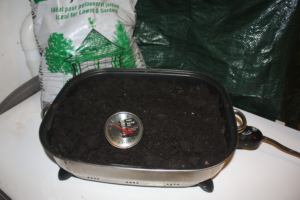 Both methods simply involves heating the soil to 820 C.
To use the micro wave, place 1 Kg. of moist soil in a polypropylene bag leaving the top open for expansion and ventilation.. Heat the soil for 2 1/2 minutes on full power (i.e. 650 watt). The photo illustrates using a kitchen appliance very readily and reasonably available at thrift stores. This one which measures 60 cm x 30 cm x 8 cm cost $4. Note the thermometer in the soil to ensure the correct temperature (820C or 1800F) has been reached. Once you determine the setting on your device, a thermometer is unnecessary. Whether using a micro wave or a cooking appliance, do not prolong the cooking as it can affect the chemistry of the soil causing toxins harmful to the plants. Sterilizing kills the much needed important microbes however once plants are transplanted to the garden, the surrounding soil will soon spread its microbes to the newly planted plant. Soil Sterilization may also reduce the possibility of blight.